About Clean Air Technology, Inc.
Clean Air Technology, Inc. is a top design and build manufacturer and contractor for modular and portable cleanrooms. Our load bearing wall & deck systems are ideally suited for all controlled environments: cleanrooms, dryrooms and contained facilities. 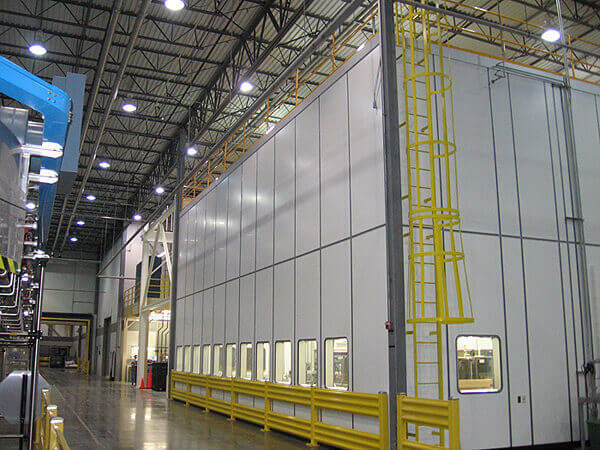 Throughout our 30+ year history, our wall/deck systems have been proven repeatedly in over 800 successful cleanroom installations worldwide. We're specialists in the turnkey design, engineering, pre-fabrication, installation, start-up and testing for ISO Std. 14644, class 1 to class 9 modular cleanrooms. In our 20,000 square foot facility in Canton, Michigan, we design and manufacture modular wall and deck systems, blower/fan cabinets and the various control and monitoring panels required. This process insures the highest quality cleanroom possible, on-time delivery and close quality control. Whether you're searching for a new cleanroom/dryroom, an update to your existing facility, mechanical upgrades, tight temperature/humidity specifications, control/monitoring and alarm panels or cleanroom components and accessories, let us handle all of the many details. Our friendly, professional sales staff is one call away from reducing the stress on your upcoming cleanroom project. Modular cleanooms/dryrooms, load bearing wall and top desk panels, WhisperQuiet® recirculation fan cabinets and custom air handlers, softwall cleanrooms, containment modules, HEPA filter systems, portable, mobile cleanrooms, positive and negative pressure P3 containerized cleanrooms, cleanroom equipment and furnishings. Cleanroom consultation and design services, environmental system audits, cleanroom/dryroom design, laboratory upgrades and modifications. Clean Air Technology's prefabricated, modular wall and deck systems are designed to provide rapid, clean installation. These modular cleanrooms/dryrooms feature an aesthetic appearance and long term flexibility to change as your process requirements evolve. Flush fitting, factory installed windows and utilities enhance cleaning. The load-bearing, double wall design, modular top deck panels and sealed negative pressure plenum assure optimum performance and longevity. The WhisterQuiet®air handlers and recirculation fan cabinets manufactured by Clean Air Technology are designed for quiet operation and durable, efficient performance in cleanrooms, dryrooms, and other demanding environments. Unlike batch-built units, our cleanroom air handlers are all custom built and equipped with drive assemblies and components that are selected for your specific applications. Clean Air Technology - a single source, turnkey cleanroom supplier serving the following market segments: pharmaceutical, semiconductor, electronics, optics, military/aerospace, medical, pharmacy, FDA validatable, manufacturing/industrial, packaging, health sciences, government.